From the ashes of Thassilon, an ancient power rises! The friends, fiends, and foes of the Pathfinder Adventure Path: Shattered Star invade your gaming table with Pathfinder Battles: Shattered Star, the brand new Pathfinder Battles prepainted miniatures set from Paizo Publishing and WizKids Games! This stunning set features 55 all-new prepainted sculpts drawn from the gorgeous art in Paizo Publishing's Pathfinder Adventure Path: Shattered Star. This guy is huge. It towers over other Large-sized miniatures. This is the best of the creatures from the Cthulhu Mythos so far! It is very tall (bordering on HUGE) and has a very good paint job and creepy opening skull-maw. That´s how a Gug should look! I love this mini. It has size, weirdness and a beautiful scuplt. I cant wait to toss this at my players. Tall enough to chew on the armpit of the Rune Giant and an excellent depiction of Andrew hou's original artwork. Easily one of my favorite pieces in the set and as tall as some of the Huge sculpts, despite his gangly frame. 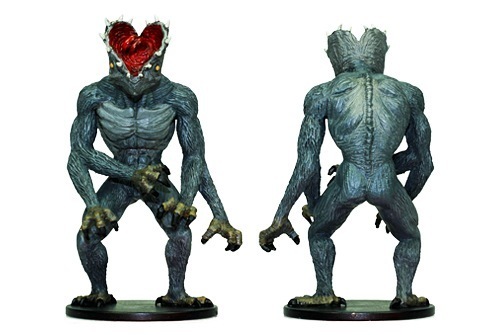 Sign in to start a discussion about Pathfinder Battles—Shattered Star: Gug!